EuroDisney was open in 1992 in Paris. It started when The Walt Disney Company wanted to bring the Disney magic to the heart of the European. Paris was chosen for its beauty and location. It is located in central location of Europe which is easily accessible by train, plane or car. However, it did not have a good start. EuroDisney was making loss initially due to various reasons. With its 15th anniversary this year, it has a new ticket, specially created for the occasion. Attached below are the tickets. Besides that, there are also special events held in conjuction with the anniversary. 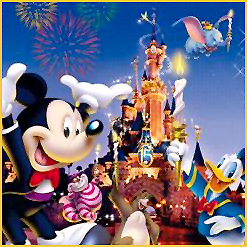 It will be a one year celebration in EuroDisney for the anniversary. Therefore, it’s really worth to go for a visit if you happen to be in Europe. The magic of Disneyland is there for everyone, whether you are old or young. The Theme Park is still continuingly to improve its facilities by providing more new attractions to its visitors. The first Disneyland was opened in California back in 1955. It is also present in Florida and Japan and the latest Disneyland was opened in Hong Kong late 2005. Disneyland Florida was voted as the 2nd top holiday destination in the world by Discovery Travel and Adventure after the jungles of Botswana, which were ranked first. This entry was posted on Tuesday, April 3rd, 2007 at 4:15 pm	and is filed under Addicting Games, Celebrity News, Funny Junk, Interesting Stuff, Magic and Illusion, Wonderful Things. You can leave a response, or trackback from your own site.